The Victoria International Marina (VIM) has initiated another exciting marine biology project to nurture marine ambassadors of the future! 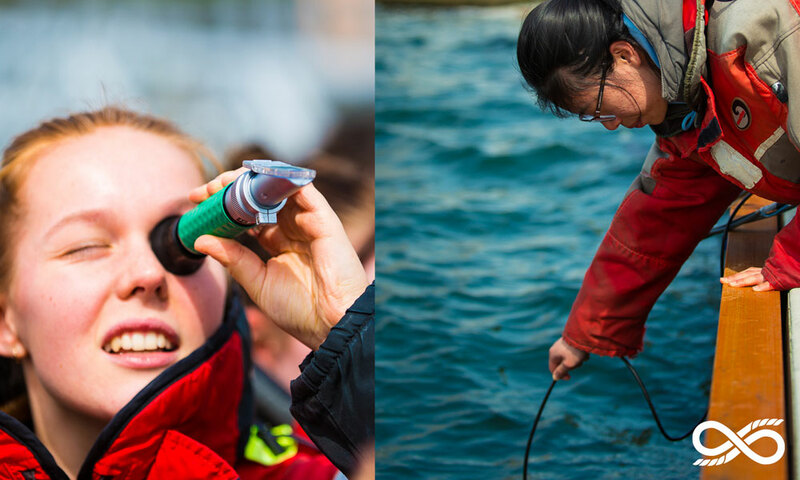 On April 17th, 2018, local high school students, along with a representative from Fisheries and Oceans Canada and the South Vancouver Island Anglers Coalition, were welcomed onto the docks of the Victoria International Marina to gather data on the local harbour-water. It is part of a salmon rearing education project proposed by the marina, and an opportunity for students to be a part of the ongoing regional efforts to replenish declining salmon stocks. The ultimate goal of the project is to provide a temporary enclosure for native wild salmon fry, allowing them to double in size before being released into the ocean, affording them a much higher chance of survival. In this first stage of the project, students were engaged in a hands-on marine biology lesson, using electronic dissolved oxygen, temperature and salinity meters, and optical salinity meters to sample water at the marina (equipment provided by Fisheries and Oceans Canada). A healthy habitat for salmon fry requires a mix of inbound and outbound fresh water; samples will be collected until the middle of June to determine if the area meets the criteria for a temporary enclosure. Upon approval from Fisheries and Oceans Canada, the salmon fry will be brought from a local hatchery, and students will help raise and release thousands of salmon fry to the Salish Sea ecosystem. After release, the salmon will have further assistance from another VIM initiative; four reef balls built by local students and placed in safe waters at the marina to provide a haven for the growing fish (and an evolving environment for students to monitor and study). Student participants commented that they enjoyed “getting to know [their] local ecosystem better…” and confirmed the lasting influence of such an opportunity: “It opens your eyes where you can go into the world and you can actually do something.” The Victoria International Marina is committed to sustainability and is pleased to provide opportunities to future ambassadors of the marine environment through education, engagement, and collaboration.